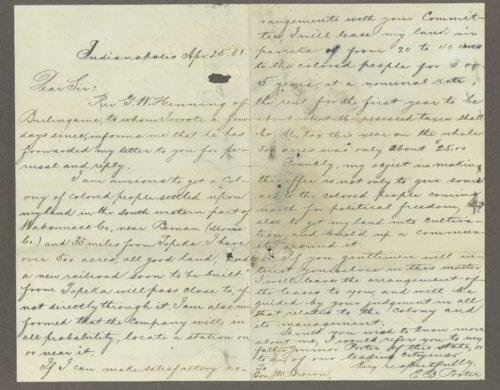 Letter written to Honorable J. M. Brown from E. B. Porter, Indianapolis, April 25, 1881, offering to lease his land in Wabaunsee County to establish an Exoduster colony. E. B. Porter was the son of Albert Gallatin Porter, Governor of Indiana from 1881-1885. A searchable transcription is available by clicking "Text Version" below.